While awaiting more complete biographical details on Gyaltsab Rinpoche, we offer you the following brief quotes, courtesy of the KTD site. THE VEN. GYALTSAB RINPOCHE WAS BORN in Central Tibet in Nyimo, near Lhasa. From generation to generation his family was well known for giving rise to highly developed yogis who achieved their attainments through the recitation of mantras and through Tantric practices. The Ven. Gyaltsab Rinpoche was one such offspring who was actually recognized by His Holiness the Sixteenth Karmapa before he was born. In 1959, Gyaltsab Rinpoche made the journey to Sikkim with His Holiness the 16th Gyalwa Karmapa. He remained for a while with His Holiness' settlement group in the old Karma Kagyu monastery, which had been built at Rumtek during the time of the Ninth Karmapa. In the early 1960's, Rinpoche received several very important initiations from His Holiness. After these initiations, his father felt that his child should receive a modern education in English, so he took him to the town of Gangtok to study. 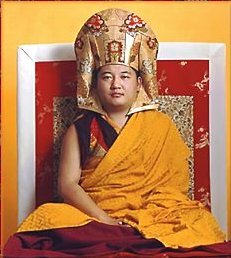 However, with his extraordinary vision of what would be truly beneficial, the young Rinpoche chose to study Dharma in His Holiness' monastery instead of remaining at the school. Just after midnight one night he left his residence in Gangtok and walked the ten miles to Rumtek alone. At sunrise he arrived at the new Rumtek monastery. When he first appeared, all the monks who saw him were surprised at his courage, and most respectfully received him in the main temple, where His Holiness welcomed him. Despite the conflict of ideas between his father and the monks about his education, he began to study the Mahayana and Vajrayana teachings of the lineage with three other high Rinpoches. Great teachers like the Ven. Gyaltsab Rinpoche show a perfect example to human beings and especially to those who can relate to the idea that one is responsible for oneself and for others as well, and that no one else is responsible for how we spend our lives, whether we build for ourselves experiences of happiness or suffering. They show us that the difference between an enlightened and an ordinary human being is not one of wealth, title or position, but only one of seeing the present reality of mind experienced at this moment.